Magnolia Elementary School recently held its Third Annual Black History Month Essay Contest! 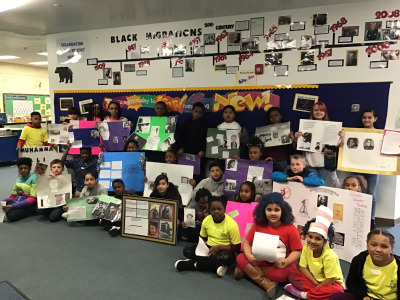 The theme for this year was “Black Heroes in the History of Education in the United States.” Students from first through fifth grades submitted essays highlighting black heroes like Ernest Everett Just to Charles Drew to Autherine Lucy. All of the student essays were very enlightening and rich with history. First place winners won 500 “rock dollars,” second place winners won 350 “rock dollars,” and the third place winner won 250 “rock dollars.” There were several happy shoppers at the school store with a whole bunch of "rock dollars” to spend! The first place winners were: Jeidy (1st grade), Givanna (2nd grade), Patrice (3rd grade), Joendy (4th grade) and Sophia (5th grade). Second place winners were: Sam'mir (4th grade) and Jayden (5th grade). The third place winner was Selina (5th grade). Magnolia Elementary wants to give a great big shout out to all of this year’s participants and to Ms. Rynel Gibbons and Ms. Churico Gore for creating the school’s Black History Month bulletin board!